You will feel like you’re in a reality TV show. Or at least like you’re a Fresher at uni again (minus the horrific mid-naughties hair-dyes and craving to stay in bed until dinner-time… but with just as much debauchery). They will throw 20+ of you together, from all corners of the United Kingdom and Commonwealth, and you will live in the sort of luxury you could only afford on Gatsby’s salary back-home. You’ll suddenly have a balcony and a swimming pool, a tax-free salary … and staff! You won’t know how to deal with staff: A concierge, porters, receptionists, an army of house-keeping… a hundred people who treat you like you inadvertently freed their people from centuries of oppression suddenly enter your life. They will fawn over you like you’re a spoiled dictator. And you will feel strangely awkward and fully thrilled all at the same time. Your polite British manners will force you to tidy your apartment before your maids arrive, as you can’t bear the notion of them thinking you’re messy or lazy, and it will also stop you from allowing the porters to carry your ONE flimsy carrierbag to your room. But the options are there if you ever wake-up feeling like a douchebag. You won’t ever get used to working on a Sunday: The weekend here runs from Friday to Saturday, as opposed to the Western Saturday to Sunday. If you’re lucky like us, you’ll find yourself working for an employer that has a 2-and-a-half-day weekend – toiling on Thursday afternoons is for losers! However… you’ll always feel cheated when you check Facebook on a Sunday and see all your UK friends doing mundane Sunday-stuff in the rain. You will add new words to your vocabulary: I have never brunched in the UK. Yet suddenly I’m expected to show up at Brunch at least once a month. It’s basically all-you-can-drink and all-you-can-eat all-Friday-afternoon at a fancy hotel which would halve the life expectancies back home. Valet – I don’t think I ever utilised the noun back in Berkshire… But here it’s hard to park a car without being accosted by several valets all intent on doing it for you. In Windsor, you’d assume they were a gang from Slough trying to pinch your wheels. In Dubai – they’re a staple part of the hierarchy. Halal – You wiil spend your life trying to find the covert UN-Halal area of the supermarket. Basically, the immoral section where good Muslims dare to tread. Here you’ll find bacon, sausages, alcohol…Your basic sustenance, basically. Driving on the other-side is FUN: Being one of those places that shirked off colonial rule as soon as it could – the Middle East is an area of the globe that drives on the Right. You DO have to get a car. I felt like a petulant teenager my first few weeks in Dubai – without a car I had to be ferried everywhere by hapless taxi-drivers and pitying-friends. Driving out here is an adventure… You WILL go around the roundabout the wrong way when you start, and you’ll definitely forget where you are a few times and give yourself a cardiac arrest by heading into oncoming traffic… but it’s all part of the Emirati experience. It even only costs around £12 to fill your entire tank with gas. Water is more expensive here than petrol. Your accent will become a mess: Predominantly living with Northerners and Londoners… I’ve started picking up a strange Yorkshire-Cockney twang. I teach mostly Australian, Canadian and Indian children… So I find odd Commonwealth-Antipodean phrases are finding their way in too. Ex-pat-brat is my new noise. You will need a water filter for your shower: The tap water here has the texture of camel spit. It will make your hair hang like straw and your skin feel like granite. Some people can deal with this. But for those as self-indulgently vain as myself? It will feel like a long-drawn-out euthanasia. Don’t deny yourself vitality and soft hair – buy a water filter! I’d recommend one from Pure Blue: All you do is screw it to your shower-head and embrace your reclaimed hotness. I’ve been rubbing my face in my smooth locks ever since it arrived. You will fall in love with the desert: Sand finds itself into the strangest places – most uncomfortable of all? Your veins. You will start feeling the urge to wander in the wilderness. 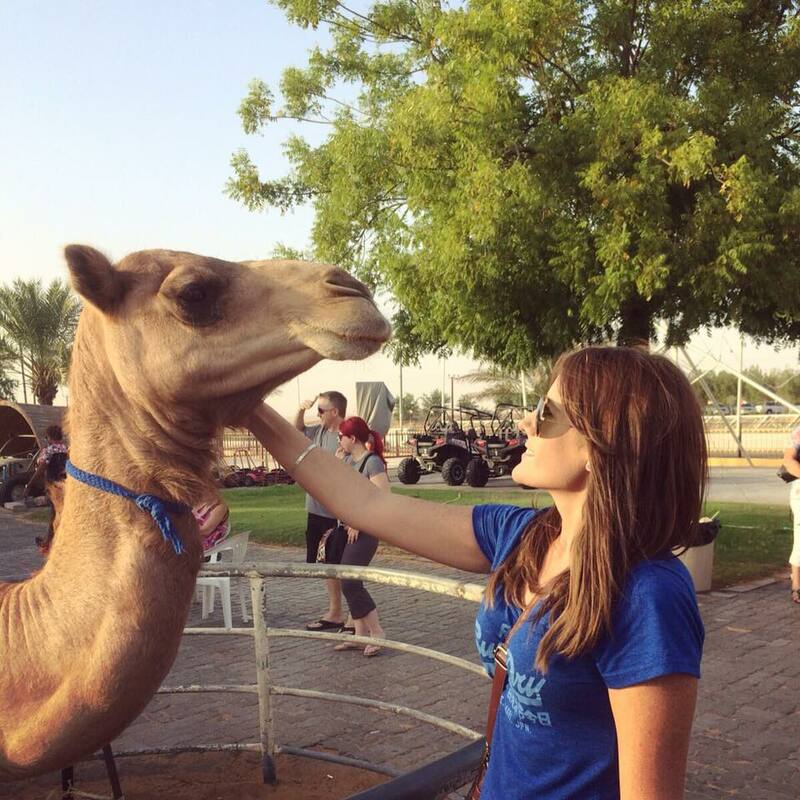 You will never get bored of trying to befriend the camels… regardless of how gratuitously they ignore you. You will stare at the nothingess for hours… and adore it. You will start constantly craving the dry dust beneath your toes and … Perhaps the heat has gone to my head. Previous A Roman Holiday: Without Gregory Peck. 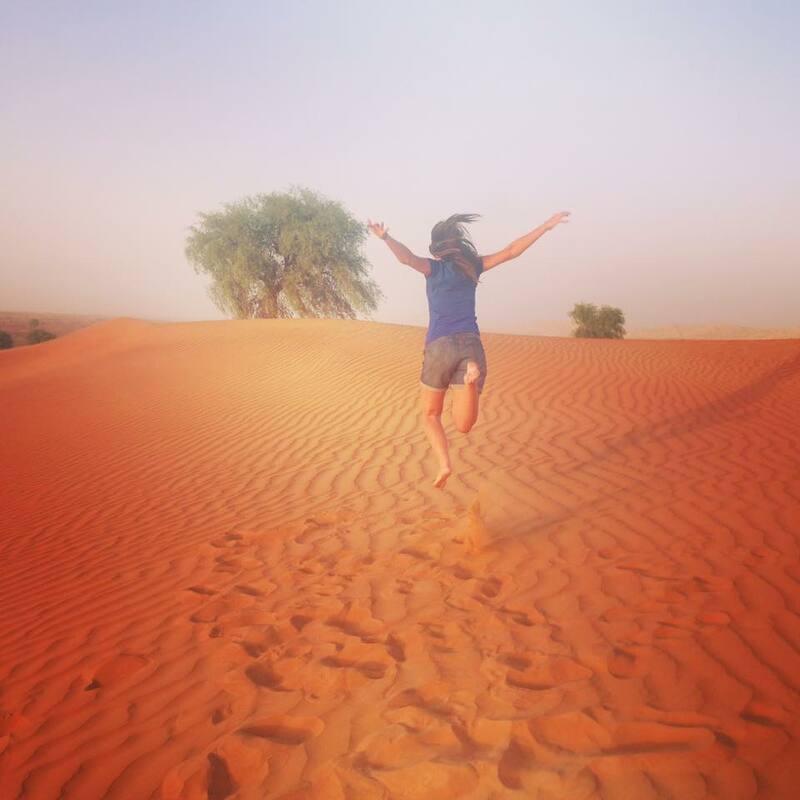 A really enjoyable read of your experience in Dubai! Lol, I would be all about that non-Halal aisle, too. And actually, in the feature photo, the camel looks pretty fond of you. 🙂 Thanks for sharing!